3DO Savegame upgrade - is there a reasonable market? Would you send your 3DO away to get 256K savegame data space added for around $50 US, add $10 for new battery and user replaceable holder. Buyer pays shipping both ways. Nope, I think it's too much money! Nope, I think it's too much hassle to send it to the US! Nope, I'm happy with the 32K originally provided! I'm testing an option to add 256K to the mainboard of my FZ-1 instead of trying to find the hard to find and too expensive memory expansion unit released in Japan. I'm in the states, and I know this forum is UK, but it was the biggest 3DO forum I could find, and I need an honest opinion on this. If my idea works, I could do this mod for around $50 US, add another $10 to replace the backup battery with a user replaceable battery holder and new battery. Buyer pays shipping both ways. I'm also entertaining the option of just sending the parts and instructions to the buyer for around $30 US. The upside - 256K of savegame data space and user replaceable battery! I haven't seen this mod available anywhere else, so I thought it would be cool to bring something to the table that is reasonably priced, and will benefit 3DO owners. Take the poll, or answer back and the results here will help me to decide if I will offer this to the public, or just mod my own 3DO and call it quits! I've purchased homebrew hardware once before: a Saturn USB datalink. It allows me to transfer saved data and homebrew games back and forth between my computer and my Saturn. Having the device has been an unqualified pleasure, as I can backup my save files and, even better, move saves back and forth between Saturn and emulator. By comparison, the option you're offering has two shortcomings. First, it would require me to either ship my console back-and-forth or mod it myself. I don't distrust you, but I'm not sure I trust you enough to have you service my FZ-1. There's also the fallible postal service to consider, and if a chance hardware failure occurred while you had my 3DO, we'd have a very awkward situation on our hands. These are all unlikely scenarios, but I don't like to take chances. Your offer to just ship the parts and instructions is appreciated, but I don't have confidence in my ability to mod an FZ-1 myself. Second, while an additional 256K is very desirable, it's not a complete solution to the 3DO's memory problems. For instance, I still wouldn't be able to move data from one 3DO to another, which would be an issue if my FZ-1 ever dies. Please don't take any of this as criticism, or even as a suggestion; I just thought it might help you to know at least one person's specific reason for being hesitant to try this. I'm impressed that you are able to do this, and if you lived next door to me (thus negating shortcoming number one) I'd pay you the $50 right now. By the way, I confess I'm rather befuddled by your references to the battery. As a Saturn owner, I'm familiar with the concept of battery-supported internal memory, but I was led to believe that the 3DO's using NVRAM means its save data is permanent. Am I wrong? NVRAM in the 3DO is provided by battery-backed SRAM. There is indeed a battery in the 3DO. See this thread. However I've only personally heard of one dieing once, so I wouldn't go with that myself. I also have a Saturn USB Datalink and being able to back-up to PC is great. I also have the Panasonic Memory Unit FZ-EM256, very cool and can be used to move files from one to another. (Also has a battery, also have only heard of one dieing). I would go for the large NVRAM upgrade IF it was proved to me that it works not just in-game but also with the Game Guru & FZ-EM256. That means video. It was mentioned not too long ago that it was done before BUT the FZ-EM256 is set up with 8 blocks of 32kb and all emulators only save max files of 32kb each. It makes me think that if even Panasonic didn't make a unit that had more than 32k at once that maybe the system isn't set up to support it. It's possible that they did it to make it simpler for people who wanted to dump entire (multiple) systems to keep things organized but I do doubt that. So I would want video proof that it even works before I'd consider it. I admit, I am honestly intrigued (especially since I have little to no electronic aptitude) but I'd have to take a wait and see approach. I think some of the other members have raised some good points. Ultimately though, I'd love to see this work for everyone involved! First, it would require me to either ship my console back-and-forth or mod it myself. I don't distrust you, but I'm not sure I trust you enough to have you service my FZ-1. There's also the fallible postal service to consider, and if a chance hardware failure occurred while you had my 3DO, we'd have a very awkward situation on our hands. These are all unlikely scenarios, but I don't like to take chances. Your offer to just ship the parts and instructions is appreciated, but I don't have confidence in my ability to mod an FZ-1 myself. Agreed. This is a tough point, as I don't like shipping things around the US, let alone around the world. I have never had anything lost or completely damaged - but there's always a first time. I would love to attempt the plugin style of the FZ-EM256, but since I can't get a hold of one of those, I can't attempt to duplicate it for the masses! This would solve this problem outright. Otherwise, possibly you know someone you trust to install the chip? Usually you can find someone that can do this, and it's a pretty simple job. My instructions would be simple, clear, and direct. I'm leaning towards Racketboy's Saturn mod idea, and that's just to send the chip and instructions to people that want to do it themselves, and forget about offering installation. The point about the failure while in my keep brings that to light. I rarely have something die that I am working on - but rarely doesn't mean never. Our 3DO's aren't getting any younger... Very good point! I would go for the large NVRAM upgrade IF it was proved to me that it works not just in-game but also with the Game Guru & FZ-EM256. That means video. Again, my problem with this is that I don't have the FZ-EM256 to see if it will work with it or not. This is actually why I started looking into an onboard upgrade.. I have Game Guru, and will have no problem adding that to my testing phase. I can say that the chip that I am working with is made by the same company as the original, and has the exact operating specs of the 32K chip, it just has 256K instead. I would think that with the specs being the same, the machine can write to it in whatever size blocks it needs to and still be accessed. Again, I could be wrong, but that's why I'm testing this idea out on my own FZ-1. As stated above, I'd love to get a hold of even a broken FZ-EM256, and then be able to make something like that. I would bet that the chip inside that unit is the same one that I am using! The chip is no longer made, and tracking them down has been difficult to say the least. After my tests are satisfactorily completed, I'm going to try to buy at least 50 chips - if there is a decent enough response for me to do so. Also, it's true that the batteries have a great life! Mine is still working, and it's original. The only problem is, no matter how long the battery works, sooner or later it will dip below the 2V minimum needed to keep the data integrity on the chip, and then it's gone. Before the battery dies, you can experience data corruption as the voltage dips. If the FZ-EM256 has a battery, I'd pull that sucker apart and put a battery holder and new battery in it. That's just me, though. Anyway, thanks for all of your input! It will help me to be able to recognize what other 3DO users want/need instead of me just coming up with something. The inherent difficulty with making something that plugs into the expansion port is that there is little information on what that port does, the pinouts, etc. Even after that, you have to get your hardware to interface with the 3DO. My upgrade, while limited by the points discussed so far, is an easy and (hopefully) very compatible process. Old chip out, new larger chip in, the end. The chip is surface mounted, not through the motherboard, so that makes it even easier to de-solder and replace. So, if anyone has a dead FZ-EM256 unit that they would be willing to sell cheap or even lend out, I would appreciate it! Also, if someone would take theirs apart and take some really good high res pix of it, both sides of the board, and the plug end, that would help too. 1) SD card support. The ability to save games to a SD card or/and the ability to load back ups (isos) and play them. 2) The same ability as above only with a hard drive. Our fellows in the soviet block have figured this out but it seems the hardware is both rare and kinda on the expensive side. 3) HDMI cable plug vice component (rca) cable plugs. I. Know with out an up scaler it isn't possible to make the 3DO true HD. With that said my 82" TV only has 2 sets of RCA inputs (one in back and one in front) however it has 6 HDMI inputs ... and I'm a lazy sod who hates. Constantly swapping cables around. The SD card would be really nice, and the IDE drive is fantastic, but I can't seem to get a hold of one of those! With the HDMI, I just run my 3DO into the S-Video port of my DVD burner, and it upscales to whatever I select! The power cord would probably be fairly easy to do, if the opening in the back was around the right size for the plugin fitting! 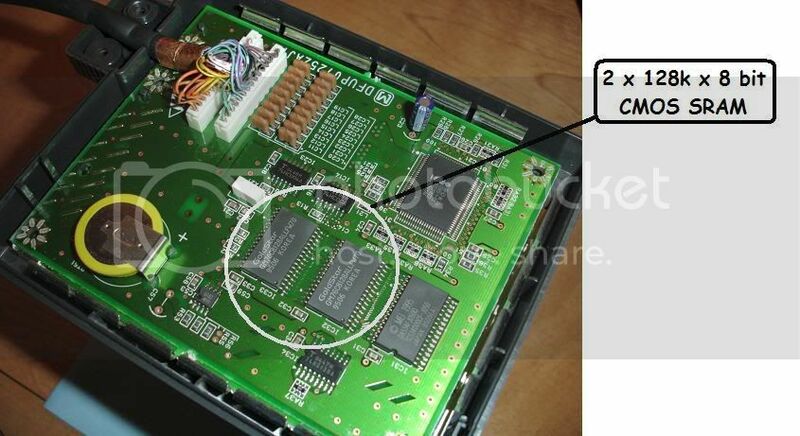 I've been doing a bit of online research, and it looks like there's VERY little information on the expansion port of the 3DO. Without some basic (and some in depth) information, it's unlikely that anyone will be able to build something that works with the expansion port. With that said, it should be invented in a matter of minutes! Last edited by TheRealAnubis on Fri Nov 02, 2012 3:05 pm, edited 2 times in total. GuruMeditation wrote: I'd definitely be interested in this - buying the part and fitting it myself. I'd prefer to do this to my FZ-10 though (in case we ever get that IDE mod, I'd have my FZ-10 modded, but keep my FZ-1 in it's original state). If it is just a chip swap, I'm guessing it would also work on the FZ-10? I do not have an FZ-10 to test, but I'm trying to get a better resolution pic so that I can have a better look! If anyone has a nice high res pic...??? Hmm, I'd be game for this as long as it works, and works well without killing my system. I remember reading on here somewhere that someone got the technical docs for the 3DO and then was going to scan them in and post them. I could really use some extra tech information on this system!